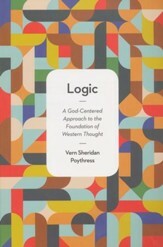 God created us as rational individuals and has established the rules of logic and good reasoning on his own nature. 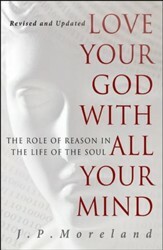 Despite being flawed and fallen, human reason is God-ordained and good because of its author. We as good stewards should be able to present logical arguments that support and defend the beliefs we maintain. This brief introduction to making effective arguments helps readers to understand the basics of sound reasoning and to learn how to use it to persuade others. 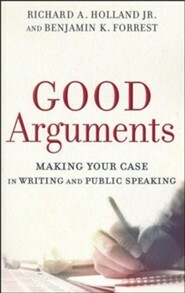 Good Arguments: Making Your Case in Writing and Public Speaking enables students in a wide variety of courses to improve the clarity of their writing and public speaking. 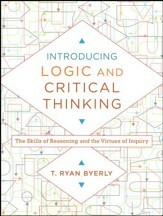 It equips readers to formulate precise arguments, avoid misconceptions, and discover how to reason well. This supplemental text is especially suitable for use in Christian colleges and seminaries and includes classroom discussion questions. This brief introduction to making effective arguments helps readers to understand the basics of sound reasoning and to learn how to use it to persuade others. Practical, inexpensive, and easy-to-read, the book enables students in a wide variety of courses to improve the clarity of their writing and public speaking. 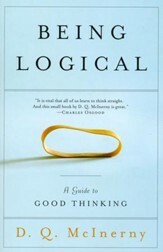 It equips readers to formulate firmly grounded, clearly articulated, and logically arranged arguments, avoid fallacious thinking, and discover how to reason well. This supplemental text is especially suitable for use in Christian colleges and seminaries and includes classroom discussion questions. Richard A. Holland Jr. (PhD, Southeastern Baptist Theological Seminary) is assistant professor of philosophy at Grand Canyon University in Phoenix, Arizona. Benjamin K. Forrest (EdD, Liberty University) is associate dean of the College of General Studies and professor of Christian education at Liberty University in Lynchburg, Virginia. I'm the author/artist and I want to review Good Arguments: Making Your Case in Writing and Public Speaking.